There is evidence to suggest Abdullah Ibn Umar (radiallah ta’ala anhu) did not deem Salat ad-Duha as a Prophetic Sunnah. Instead Ahadith record he believed it was a innovation and a practice which did not exist during the life time of Prophet (sallallahu alayhi wa aalihi was’sallam) nor in the life of first two rightly guided successors of Prophet (sallallahu alayhi wa aalihi was’sallam). He is reported to have said Salat ad-Duha is a fine innovation. Ibn Umar’s (radiallah ta’ala anhu) this statement allows Muslims to deduce that Islam has room for good/fine innovations which the opponents of Muslims reject and choose to disbelieve. Please do note; we Muslims believe Salat ad-Duha is a Prophetic Sunnah and Ibn Umar (radiallah ta’ala anhu) was not witness to Prophet (sallallahu alayhi wa aalihi was’sallam) performing Salat ad-Duha. In a Hadith it is stated Prophet (sallallahu alayhi wa aalihi was’sallam) so dutifully performed Salat ad-Duha which lead the companions to believe he would not leave it. And then left it for long periods of times leading them to think he will not perform it again: “Abu Sa'eed Al-Khudri narrated: "The Prophet would pray Ad-Duha until we would say: 'He will not leave it.' And he would leave it until we would say: 'He will not pray it.'" [Ref: Tirmadhi, B3, H477] In another Hadith Abu Huraira (radiallah ta’ala anhu) narrated Prophet (sallallahu alayhi wa aalihi was’sallam) instructed him engage in three actions – one of which was two Rak’at of Salat ad-Duha: “Narrated Abu Huraira: My friend/Khalil (i.e. Prophet sallallahu alayhi wa aalihi was’sallam) advised me to observe three things: (1) to fast three days a month; (2) to pray two rak`at of Duha prayer; and (3) to pray Witr before sleeping.” [Ref: Bukhari, B31, H202] Following Ahadith record the number of Rak’at performed and how many he would perform at a time: “It was narrated from Umm Hani’ bint Abu Talib that on the day of the Conquest (of Makkah) the Messenger of Allah prayed voluntary Duha with eight Rak’ah, saying the Salam after each two Rak’ah.” [Ref: Ibn Majah, B5, H1323] “Mua'ada Adawiyya reported Aisha as saying: The Messenger of Allah used to observe four Rak’ah in the Salat ad-Duha prayer and he sometimes observed more as Allah pleased.” [Ref: Muslim, B4, H1551] Ahadith also narrate benefits of performing Salat ad-Duha but these Ahadith are of questionable grading. And Muhaditheen employ principle; weak Ahadith are strengthened if there are multiple chains for it, which is true for these Ahadith. And Ulamah also employ principle, weak Ahadith which mention merits of an action are usable. In this context regular practice of Salat ad-Duha will amount to forgiveness of innumerable sins, and according to another Hadith, in Paradise Allah (subhanahu wa ta’ala) will build palace of gold for practioner of Salat ad-Duha. In a Hadith Aysha (radiallah ta’ala anha) is reported to have said; Prophet (sallallahu alayhi wa aalihi was’sallam) performed Salat ad-Duha after returning from a journey: “Abdullah b. Shaqiq reported: I asked 'A'isha whether the Messenger of Allah used to observe the forenoon prayer. She said: No! But when he came back from the journey.” [Ref: Muslim, B4, H1546, H1547] Note she stated, Prophet (sallallahu alayhi wa aalihi was’sallam) did not perform Salat ad-Duha and then affirmed it for him saying he performed it after he returned from a journey. This indicates questioner inquired if Prophet (sallallahu alayhi wa aalihi was’sallam) performed Salat ad-Duha regularly and she negated this. And then felt the need to specify when Prophet (sallallahu alayhi wa aalihi was’sallam) perform it. She is also reported to have said: “Narrated Aisha: I never saw the Prophet offering the Duha prayer but I always offer it.” [Ref: Bukhari, B21, H273] “Narrated `Aisha: Allah's Messenger used to give up a good deed, although he loved to do it, for fear that people might act on it and it might be made compulsory for them. The Prophet never prayed the Duha prayer, but I offer it.” [Ref: Bukhari, B21, H228] Again her negation is in context of Prophet (sallallahu alayhi wa aalihi was’sallam) performing Salat ad-Duha regularly and her saying she performs Salat ad-Duha is in context of regularly performing Salat ad-Duha. From this it becomes apparent she deemed regular practice of Salat ad-Duha as something which Prophet (sallallahu alayhi wa aalihi was’sallam) has not done. Ahadith record Abdullah Ibn Umar (radiallah ta’ala anhu) was asked if he himself, and Prophet (sallallahu alayhi wa aalihi was’sallam), Abu Bakr (radiallah ta’ala anhu) and Umar (radiallah ta’ala anhu) performed Salat ad-Duha, and he replied in negative: “Narrated Muwarriq: I asked Ibn `Umar "Do you offer the Duha prayer?" He replied in the negative. I further asked, "Did `Umar use to pray it?" He (Ibn `Umar) replied in the negative. I again asked, "Did Abu Bakr use to pray it?" He replied in the negative. I again asked, "Did the Prophet use to pray it?" Ibn `Umar replied, "I don't think he did." [Ref: Bukhari, B21, H27] Ibn Umar’s (radiallah ta’ala anhu) answer naturally implies Salat ad-Duha is an innovation. Sahih Bukhari and Muslim each record Hadith in which he is explicitly as been reported to have said, Salat ad-Duha is an innovation: “Mujahid reported: I and 'Urwah b. Zubair entered the mosque and found 'Abdullah b. 'Umar sitting near the apartment of A'ishah and the people were observing the forenoon prayer. We asked him about their prayer, and he said: It is an innovation.” [Ref: Muslim, B7, H2883] “…and some people were offering the Duha prayer. We asked him about their prayer and he replied that it was an innovation." [Ref: Bukhari, B27, H4] Following Hadith establishes Ibn Umar (radiallah ta’ala anhu) deemed it to be a good innovation: “Ibn Ulayyah narrated to us, Jarir narrated, al-Hakim bin A'raj narrated; I asked Muhammad about Salat ad-Duha, while he was sitting near the house of Prophet (sallallahu alayhi wa aalihi was’sallam). He said: It is an innovation and what a fine innovation it is!" [Ref: Musannaf Ibn Abi Shaybah, Kitab Of Prayer – Salat ad-Duha, H3] Yet in another Hadith it is stated; Ibn Umar (radiallah ta’ala anhu) deemed Salat ad-Duha to be an innovation and it was very dear/loved by him: "Narrated Muamar, narrated al-Zuhri, narrated [by Ibn Umar’s son] Sa'lim, [that his father] Ibn Umar said: At the time Uthman was killed no-one considered it desirable and the people did not innovate anything that is dearer to me than that prayer." [Ref: Musannaf Abd ar-Razzaq, Book Of Salat (No.2 ), Chapter al-Duha, H4868] Note this Hadith indicates Ibn Umar (radiallah ta’ala anhu) might have started to practice Salat ad-Duha. And after realising its goodness it became dear/beloved to him. Statements of Ibn Umar (radiallah ta’ala anhu) establishes that he believed in evil innovations and good innovations. And he deemed Salat ad-Duha to be good innovation which was dear to him. This also establishes that companions did not believe absolutely every innovation is misguidance but believed innovations which conformed to Prophetic teaching can be good. Ibn Umar (radiallah ta’ala anhu) was aware performing Salat ad-Duha conformed to Prophetic teaching according to which Nawafil can be performed in all times except the prohibited times of sunrise/sunset and this is evident from his words: "I do only what my companions used to do and I don't forbid anybody to pray at any time during the day or night except that one should not intend to pray at sunrise or sunset." [Ref: Bukhari, B21, H283] Regarding good innovations Prophet (sallallahu alayhi wa aalihi was’sallam) is reported to have said: “He who introduces a good Sunnah in Islam, there is a reward for him for this and reward of that also who acted according to it subsequently, without any deduction from their rewards …” [Ref: Muslim, B34, H6466] Note in the Hadith Prophet (sallallahu alayhi wa aalihi was’sallam) did not say, he who introduces my good Sunnah of Islam. This would have indicated; reward is for a Sunnah which is already part of Islam as Sunnah of Prophet (sallallahu alayhi wa aalihi was’sallam). Prophet (sallallahu alayhi wa aalihi was’sallam) has stated: “He who introduces …” implication of which is; Prophet (sallallahu alayhi wa aalihi was’sallam) is referring to every Muslim who introduces his own Sunnah. And then says: “… introduces a good Sunnah in Islam …” Meaning introduces a Sunnah in Islam which is not already part of Islam. 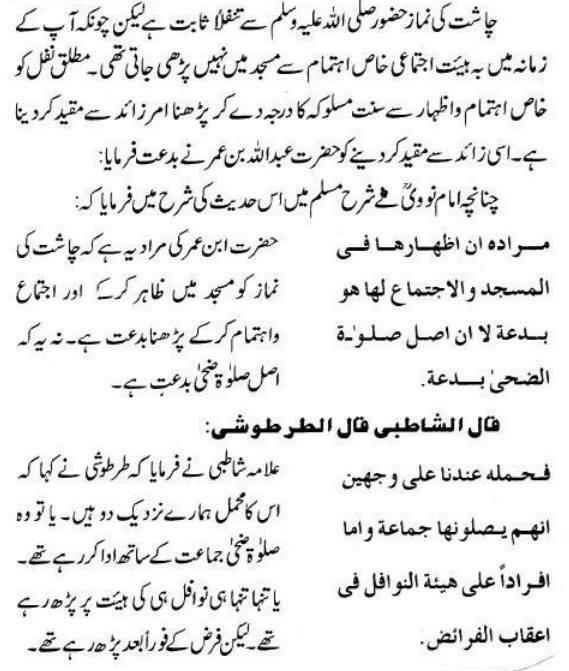 Alhasil, Hadith indicates Sunnah for which Prophet (sallallahu alayhi wa aalihi was’sallam) told of reward is not already part of Islam and is not Sunnah of Prophet (sallallahu alayhi wa aalihi was’sallam) but Sunnah of Muslim who issues it. And this is precisely the meaning of word innovation and following Hadith also corroborates that the reward is for innovated good Sunnah: “The Messenger of Allah said: 'Whoever sets a good precedent in Islam, he will have the reward for that, and the reward of those who acted in accordance with it, without that detracting from their reward in the slightest.” [Ref: Nisa’i, B23, H2555] And Ibn Umar (radiallah ta’ala anhu) judged the issue of Salat ad-Duha being good innovation on basis of these Ahadith. Aysha (radiallah ta’ala anha) has narrated Ahadith according to which Prophet (sallallahu alayhi wa aalihi was’sallam) did and did not perform Salat ad-Duha. Principle of Muhaditheen is that which attests takes precedence over that which negates. And therefore those Ahadith which establish Salat ad-Duha being Prophetic Sunnah are to be preferred over those Ahadith of her which negate it. In addition contradicting Ahadith can be reconciled; ones which negate are negating regular practice and those Ahadith which attest to Salat ad-Duha being Prophetic Sunnah are regarding Prophet (sallallahu alayhi wa aalihi was’sallam) performing Salat ad-Duha after returning from journey or reaching a destination. This leads to conclusion in context of her that she practiced Salat ad-Duha regularly which she believed Prophet (sallallahu alayhi wa aalihi was’sallam) did not do. Ibn Umar (radiallah ta’ala anhu) believed Salat ad-Duha was not performed by Prophet (sallallahu alayhi wa aalihi was’sallam) nor by the first two Khulafah and therefore he did not perform it. And based on this he deemed Salat ad-Duha to be an innovation and a good innovation which was dear to him. He was unaware of Prophet (sallallahu alayhi wa aalihi was’sallam) performing Salat ad-Duha and this led him to deem it innovation. His statements cannot be valid evidence to negate the established status of Salat ad-Duha but his statements do establish he believed in Islam there is room for and there is permission to introduce good innovations. -  Some say, she was asked if Prophet (sallallahu alayhi wa aalihi was’sallam) performing Salat ad-Duha as part of congregation in Masjid on regular basis. And in response to this she said, she never saw Prophet (sallallahu alayhi wa aalihi was’sallam) performing Salat ad-Duha. This is incorrect because, she has brought into the answer, her seeing (i.e. رَأَيْتُ). If she was asked about Masjid she would be negating it via knowledge; ‘I don’t know.’ because she did not attend Masjid. Her negation via personal vision is indicative that she is negating Prophet (sallallahu alayhi wa aalihi was’sallam) performing Salat ad-Duha where she could have seen him (i.e. at home) but hasn’t seen him engaging it it which she should have if he had performed it reglar basis at home. Alhasil her negation is connected with regular practice of Salat ad-Duha. -  It was not Muhammad who was asked, Ahadith refferenced in footnote 3 and quoted in the article establish Ibn Umar (radiallah ta’ala anhu) was asked. 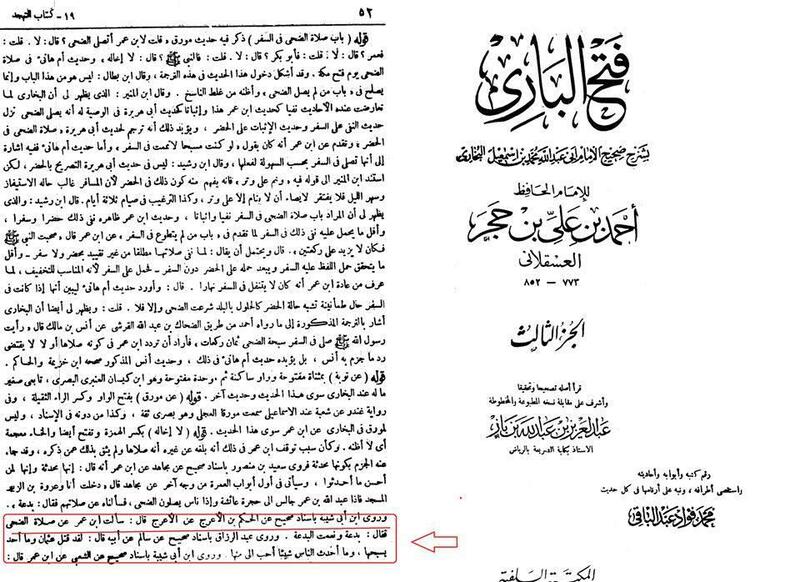 So it seems one of the narrators confused the name of Ibn Umar (radiallah ta’ala anhu) with Muhammad. -  Please note my Arabic is very limited and I am in no way qualified to translate from Arabic to English. Unique element of the Hadith have been kept while ensuring it resembles in meaning or coroborates other Ahadith. Such as, Hadith of Bukhari, No. 27, and Muslim, Hadith, No. 2883, quoted above, state he was sitting close to house of Ayshra (radiallah ta’ala anha). If there is any fault in translation please do inform me. Bhai is bary mein kafi Arsa pehly maine post ki thi..
wo yahan bhi share kar dyta hon..
حضرت عبدالله بن عمررضی اللہ تعالیٰ عنه اور بدعت حسنہ..
Is Hadees ki kuch Wazahat jo Mujhy mili thi..